My mother visited for a month. I worried she would fall in the tub shower. I need safety bars. Can I install them? 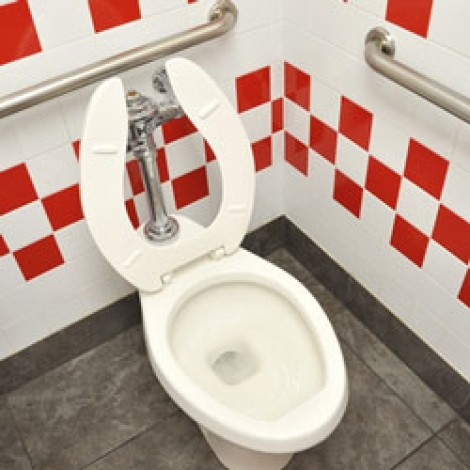 Answer: It should be a building code requirement to have grab rails in bathrooms. They are a big help and easy to install. There is a big variety of grab bars and you should choose carefully. A grab bar should have a non-slip grip, non-twisting bar, non-metallic (metallic bars must be grounded for electrical shock) and a size to suit the conditions. Don’t depend on a towel bar to support your weight. The ceramic soap dish and grab handle could break loose if too much pressure is applied. Also install a non-slip decal on the bottom of the tub or floor of your shower. The added safety factor offers a good comfort level as you step into a wet tub or shower stall. No special tools are needed with the exception of a masonry drill bit if you have to make a hole in ceramic tile. A stud finder is a big help. Grab bar prices range from $20 to $35 depending on the size. A 16” bar generally fits stud spacing and costs about $22. The decal kit is another $10. Two bars and a decal kit will cost you $65 for the safety of your family. You should be able to install the grab bar in an hour or two. Based on your height and size, determine the best location for the grab bar. Generally, above the end of a tub and on the long wall of the tub. On the long wall a diagonal or vertical bar is helpful because it allows you to lower yourself into the tub and reach the bar from a sitting position. Find the studs in advance. It is critical that the bars are anchored solidly into a stud. Using the bar flange for a template, locate where to drill for the anchor screws. Most tubs have a shower head and the walls are tiled. Using a masonry drill that is slightly larger than the screw, drill through the ceramic tile. With another bit slightly smaller than the screw, drill into the stud. Apply silicone caulking into the holes and attach the flange to the wall. Put the bar in place, snap the flange covers in place.